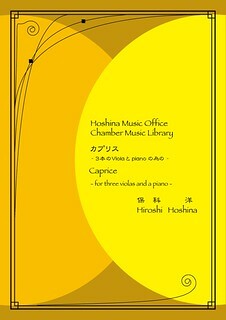 This miniature caprice is taken from the middle part of Caprice for wind orchestra and and arranged for three violas and piano at a request of the composer’s daughter. The melancholic melody rises a profound atmosphere when it is performed by three viola’s deep tone. This sheet music is available for free for personal use only. All rights reserved. Unauthorized duplications and redistributions are prohibited. This music if also available for Violin, Viola, Violoncello and Piano.